Live the Quintessential California Wine Country Lifestyle Surrounded by iconic vineyards views in this striking contemporary new construction home plus casita and pool. Located in the exclusive Jespersen Ranch, a new privately gated community on the Central Coast with only five lots, each one acre, this coveted property captures sensational vistas of the vineyards and surrounding Seven Sisters peaks. Meticulously designed for savoring San Luis Obispo's Mediterranean climate year around, the floor plan envelopes al fresco living areas offering true harmony between indoor and outdoor living. With brilliant natural light streaming in from walls of glass, the home exudes a luminous spacious ambience. The 4,507 sf main home offers 4 en suite bedrooms and 4.5 baths, while the attached 600 sf casita offers 1 bd/1 ba. The focal point of the home is the expansive great room and open kitchen, showcasing soaring two story ceilings and wall of oversized sliding glass doors opening to outdoor entertaining areas with covered outdoor kitchen, pool and spa. Nestled into its own wing of the home, the master suite offers the ultimate escape. 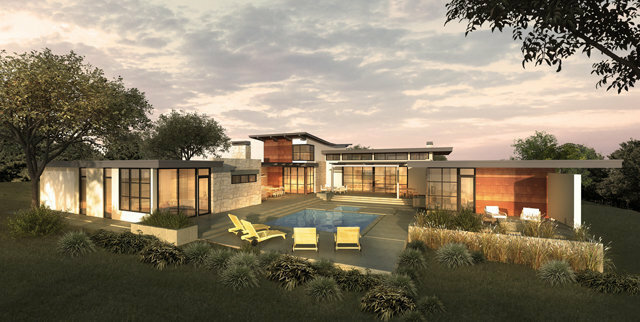 Premium modern finishes for the property include hardwood flooring, quartz counters, walnut cabinetry, glass pivot front entry door and linear fireplaces in the great room and outdoor dining area.